The Small Toboggan Table may have received its name from the snow sleds that have a similar bent wood shape. 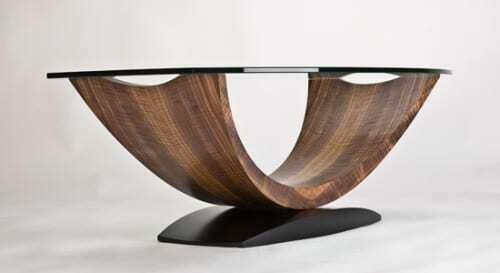 This amazing modern coffee table features Blood Wood and Amazaque veneers over laminated birch plywood with a signature by designer Kino Guerin underneath. 13″H x 20″W x 42″L $1750 All of these coffee table are available for mail order shipment.